A post on the British Library manuscripts blog tells me something once almost unimaginable: that fully half the Greek manuscripts in the collection are now online and accessible to the world 90% of the Greek manuscripts of the BL will be online by March. All credit is due to Julian Harrison and his team for this massive work, and also to the Stavros Niarchos foundation – never was Greek shipping money so well deployed! – and the other funding bodies. Add MS 24372, Gregory of Nazianzus, Orationes: 1, 11, 14-16, 19, 21, 24, 38, 39, 40-45; 11th c.
Add MS 24381, Gregory of Nazianzus, Orationes, most being imperfect at the beginning, owing to miniatures which have been torn out. 1079 or 1088 AD. Add MS 28823, John Zonaras, Commentary on the Canons of the Apostles, of the ecumenical and local councils and of the Fathers, and related texts. 4th quarter of the 14th century. Add MS 28825, Greek translation of Ephraem the Syrian, Homilies, imperfect, and other patristic texts, including Isaiah of Gaza, Asceticon, Nilus of Ankara, Epistola ad Diaconum Achillium. Marcian of Bethlehem, and John of Lycopolis. 12th century. Add MS 34554, Lives of saints and theological discourses, imperfect. 16th century. Add MS 35212, John Chrysostom, In Genesim homiliae 10-17, imperfect. 11th century. Add MS 36669, Apophthegmata Patrum: a compilation of the Greek Church Fathers, bearing the title Λειμὼν ἐνθάδε καρπῶν πεπληρωμένος. 14th century. In a 17th-century binding of boards covered with leather with gilt ornament, the centrepiece representing on the upper cover the Crucifixion, on the lower cover David and the angel of the Lord. Add MS 36754, Basil of Caesarea, Homilies on the Hexameron and John Chrysostom, Homilies on Genesis, imperfect and mutilated. 11th century. Add MS 36821, Works of Pseudo-Dionysius the Areopagite, with the marginal commentary of Maximus the Confessor, and additional texts relating to Pseudo-Dionysius. 1st half of the 10th century, possibly copied from an uncial manuscript of Pseudo-Dionysius written by Methodius, future Patriarch of Constantinople, at Rome. Add MS 39608, John Chrysostom, In Genesim homiliae 1-133. 13th century. 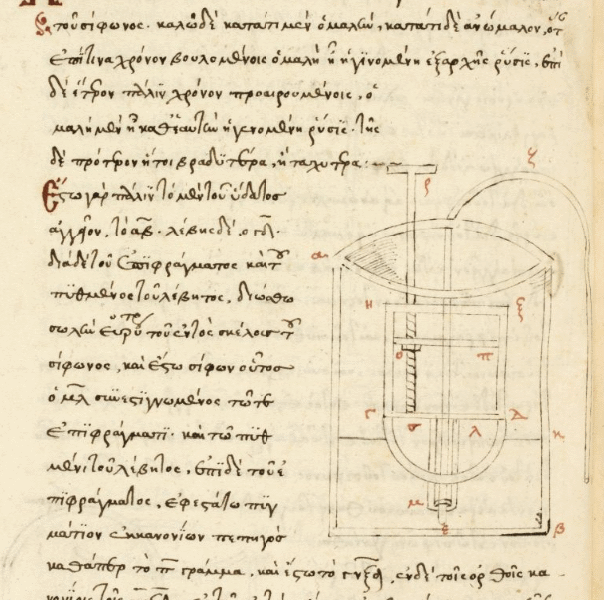 Burney MS 100, Works of Aristotle, preceded by Porphyry, Isagoge. Italy, N? 1st half of the 15th century. Burney MS 111, Ptolemy, Geographia, with many diagrams and coloured maps, all except that on f 1v being later fifteenth-century replacements on inserted leaves. 4th quarter of the 14th century-1st quarter of the 15th century. Harley MS 5600, Homer, Iliad, with prefatory material. Florence, completed on 16 May 1466. With a full-page frontispiece in colours and gold on f 15v; a full white vine border in colours and gold on f 16r; 25 white vine initials in colours and gold. Kings MS 16, Homer, Iliad. Italy, 1431. Now how about making it possible to download a PDF of each manuscript? UPDATE: A kind correspondent writes to advise me that this is actually the half way point of the current project; and that in fact 90% of all the mss will be online by the spring. This is even better news! I’m getting interested in the manuscript tradition of the works of Polybius. Basically books 1-5 of his history come down to us directly. Books 6-18 are transmitted by a collection of excerpts known as the Excerpta Antiqua. Finally there are long quotations in some of the compendia of the time of Constantine Porphyrogenitus. I have just ordered a copy of Moore’s study on the mss., and will doubtless know more on Monday. But a google search revealed that one ms. of books 1-5 is accessible at least: British Library, Additional, 11728, written in 1416. Looking at my Loeb of book 1, I can even read the Greek script (not, for me, by any means to be taken for granted). I was interested to see that the text was divided into sections, each marked with a red capital letter. Not, I note, the same ones used in the Loeb! There is an interesting post at the British Library manuscripts blog, Images in the public domain. Just a reminder that images from our Catalogue of Illuminated Manuscripts are now available under a Public Domain mark. This means that they are available for download and reuse, on condition that certain basic principles are observed: (1) please respect the creators; (2) please credit the source of the material; (3) please share knowledge where possible; (4) please consider the efforts of the British Library in preserving and making such works available, should they be used for commercial or other for-profit purposes. Now that is extremely interesting. It is also very laudable — well done! That is precisely what should be the case. Please respect the creators – ensure traditional cultural expressions and all ethical concerns in the use of the material are considered, and any information relating to the creator is clear and accurate. Please note, any adaptations made to an item should not be attributed to the original creator and should not be derogatory to the originating cultures or communities. Please share knowledge where possible – please annotate, tag and share derivative works with others as well as the Library wherever possible. Support the Public Domain – users of public domain works are asked to support the efforts of the Library to care for, preserve, digitise and make public domain works available. This support could include monetary contributions or work in kind, particularly when the work is being used for commercial or other for-profit purposes. Please preserve all public domain marks and notices attached to the works – this will notify other users that the images are free from copyright restrictions and encourage greater use of the collection. I think that is more than fair. In particular supporting the public domain is precisely what this blog exists to do. Again … well done! This is the sort of thing that every national collection should be doing. By making images available in a way that promotes reuse and the creation of derivative works, they enrich the culture of today. Posted in From my diaryTagged British Library, British Library Digitisation6 Comments on Manuscript images at the British Library are “public domain”? The British Library is committed to making available online as many of its medieval manuscripts as possible. And then it goes on to discuss how the ancient Codex Alexandrinus of the bible, currently bound in 4 volumes, had to be taken apart to be photographed. Nor is this surprising, as anyone who has handled the British Library’s manuscripts will know. The bindings are frequently like iron. In the case of Codex Alexandrinus, the opening of the manuscript was heavily compromised by the last re-binding, which jeopardised our ability to photograph properly each page in its entirety. Bound books are very complex structures: they are made of many different materials and the interaction between the writing support and the mechanics of the sewing structure is vital to their survival. Unfortunately, it had been the practice in recent centuries to attach too-heavy spine linings (made of layers of stiff paper and weak fabric) to the back of book blocks, which in many cases has only served to compromise their opening. This was found to be the case when Codex Alexandrinus was examined prior to digitisation. The first requirement was to reach the back of the book block, which entailed removal of the cover. Next, the parchment book block was gently cleaned by removing the different layers of unsuitable materials, releasing the pressure on the folds of individual sections, and improving considerably the opening of the manuscript. A new reinforcement made of archival suitable materials was then placed onto the spine to support the opening of the book, and to increase the strength of the connection between the book block and the cover. Finally, the cover was re-adhered to this volume of Codex Alexandrinus. By doing this, the manuscript could be opened sufficiently to image its pages. What is encouraging is that the library had the wisdom to do this. In ancient times manuscript bindings were detachable. If the modern bindings are unserviceable, and not of historical importance, then there is no reason not to adjust them. The British Library continue their digitisation of their manscripts, which is very welcome. They’ve moved on to the Royal collection, although the focus seems to have drifted back to digitising “pretty books” and medievalia, rather than the material that classics and patristics scholars will want. There is a Tertullian in that collection, which ought to be online. But I have given up making suggestions and requests, since it never seems to have any effect. Royal 6 C. i — Isidore of Seville’s Etymologiae, England (St Augustine’s, Canterbury), 4th quarter of the 11th century. Posted in From my diaryTagged British Library Digitisation, ManuscriptsLeave a Comment on More British Library mss. At the British Library manuscripts blog, there is news. We are delighted to announce that the remaining manuscripts in our Harley Science Project have now been published to the British Library’s Digitised Manuscripts site. All 150 manuscripts in this project have been digitised and recatalogued thanks to the generosity of William and Judith Bollinger. We hope that this resource, part of our ongoing campaign to make our collection items more accessible, will promote new research into the books in question. I hope so too. It can’t do the slightest harm. The cataloguing is pretty good too, I have to say. But … I wish we could get PDF’s of the mss, rather than being at the mercy of slow broadband and a quirky interface. I suspect it will come, once libraries recognise that it doesn’t harm them in any way. Access to these texts was always the problem; only a tiny handful of geographically local scholars could do much. Now … there are NO excuses for lazy scholarship. Get publishing articles, gentlemen! In the current tranche, the following items will be of interest to us. Harley 3892 Miscellaneous texts on rhetoric, grammar, geometry and divination (Italy, 1400-1454) — this actually also contains parts of Horace, Ars Poetica and Letters. Harley 3915 Collection of chemical, alchemical and medical recipes, and texts on the techniques and technology of various arts (Germany, 1200-1444) — Includes an extract from Vitruvius, and an autograph note by Nicholas of Cusa, indicating that this book once belonged to him (and so ought to be in Berkastel-Kues with the rest of his books). Harley 3969 Works on history, natural history and rhetoric (England, 14th century) — Actually includes extracts from: Cassiodorus, De orthographia, Censorinus de natali die, Apuleius, Dares Phrygius, Pliny the Elder, and Jerome’s Letter to Helvidius. Harley 4241 Aristotle, Metaphysica (Germany, c. 1450-1464) — Another of St. Nicolas of Cusa’s books. There are a number of other Latin translations, of Euclid and Aristotle. The Stavros Niarchos foundation continue to fund the digitisation of Greek manuscripts at the British Library, who in consequence are still shovelling them online. Thank you both, gentlemen: this is good news. Long may it continue! A new tranche of 75 was released today, bringing the total to 500. Fortunately the library staff have started to give a summary of the contents of each manuscript, which can be found at the bottom of the post. So, what goodies are there for patristic and classically minded people in this release? There’s a 16th c. copy of Photius’ Bibliotheca cod. 1-222 — i.e. nearly all of it — in Harley Ms. 5591. Hero of Alexandria, Pneumatica and De automatis, Harley 5605, with diagrams. (16th c.) These are the texts in which he describes his machines. Here’s one of the diagrams (fol. 10v). I was curious to see whether these were copies of ancient diagrams. But … they look more like modern ones to me. Useful to be able to see what the manuscript contains, tho. I wonder if there are online English translations of these two works? Greek scientific literature is shamefully neglected. Ms. Harley 5638 is not well catalogued, being given merely as “Plutarch and Philostratus”. Here is where the limitations of the online viewer kick in — it really would not be a simple task to leaf through the book and discover precisely what it contains. Harley 5643 contains a “patristic miscellany”, much of it from Chrysostom (and there’s a thought: given that you usually can’t breathe for codices of Chrysostom in any collection of Greek mss., isn’t he shamefully under-represented in the 500 mss we have had so far?) There’s a scholion of Eusebius in there too — on what I cannot say. Harley 5646 is another of the same, mostly 216 letters by Chrysostom. Harley 5677 contains the Catena of Nicetas on the Psalms! Now that is well worth having! And almost immediately I learn something novel and interesting on fol. 1v, which is how the names of the authors excerpted appeared in 17th century copies of the catenas. For it is very hard to work this out, from editions of catenae like those of Cramer. The sigla are in red in the margin. The top one is “xru” — probably Chrysostom. The lower one is “athana” — probably Athanasius. I wonder what the bit above the name is, in each case? What we need now, of course, is a list of authors and folio numbers for each. That would be quite a task, tho! Harley 5689 is a bunch of Chrysostom, including homiles 4-8 of the homilies against the Jews. This one is 11th century. Harley 6296 is the “impious Porphyry”, De Abstinentia. Harley 6305 is medical works by Galen and Paul of Aegina. Of course I am just scratching the surface here. Go and explore! From the BL manuscripts blog I learn that a further 74 Greek manuscripts have been added to their online site. The site uses proprietary technology to ensure that users can’t download images — perish the thought! — but is still better than nothing. The blog post gives a list of manuscripts. Previous lists just gave the shelfmark, but this time, thankfully, they have indicated the contents. Harley 5564 – Epiphanius of Salamis, De duodecim gemmis, 16th century. Harley MS 5593, ff 207-207v — (3). Extracts from Philip of Side inc. (a) ἀλλ’ὁ θεὸς ἀνελθόντι τῷ βασιλεῖ εἰς τὸν ναὸν; (b) ὁ τοίνυν Βαλτάσαρ τὶ συμβησόμενα αὐτῷ δεινὰ μεμαθηκὼς. Regular readers will remember that I commissioned a translation of all the fragments of Philip of Side, which is here. I wonder, therefore, what this is? I’ve asked Andrew Eastbourne to take a look, and we’ll see. In other news, I have emailed a Dutch academic to ask about people who might be willing to translate some Old Slavonic for us all. I am, of course, thinking about the works of Methodius!